Terrible Posture Games, the mostly one-man studio, that in 2014 he released the FPS rouge-lite: Tower of Guns, announced Mothergunship. It is a bullet hell/FPS hybrid, where you use your massive guns to fight off robotic aliens enemies. Considering that genres that are mixed, and the trailer, gameplay will involve mostly running really fast dodging the massive bullets, rather than trying to tank them like some of recent FPS’s. And the other bullet point (pun intended) for this game is the gun crafting system, and how insane you can go with it(as seen for like 20 frames) in the trailer. 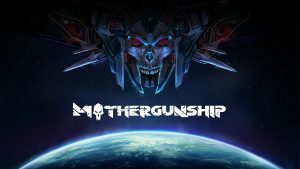 Fight together with a friend in a full co-op experience, or participate with the community while you work together to cut through the alien fleet and reach that ultimate goal—bringing down the Mothergunship. For more info screen shots, and sing-ups for more news, including possible play-testing opportunities from the game’s website.